TownleyGirl My Little Pony Lip Balm Set with mirror allows your daughter to glitz and glam up with this set with lipstick in blue cotton candy, green watermelon, light pink strawberry, and purple grape. 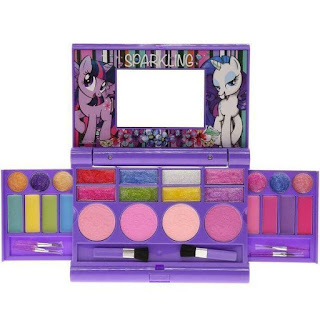 My Little Pony Cosmetic Set has 22 lip glosses and 4 blushes. Some of the flavors of lip gloss bubblegum, cotton candy, and berry. You also have 2 brushes to apply the blush and 4 brushes to apply the lip gloss. You also have a mirror with Twilight Sparkle and Rarity. My Little Pony Nail Polish has 12 nail polishes in the colors of aqua, light purple, white glitter, orange glitter, yellow, baby blue, pink glitter, green glitter, dark purple, red, blue, and fuchsia with 2 toenail files. My Opinion: these are great colors for my grandniece because she told me the other day that she wanted to paint her nails one each different colors so this trip set of 12 is perfect for her and they are easy enough for her to hold in handle without dropping it. Cosmetic case is a cute mare on it so your little girl can get all glammed up. I also like my mirror and lip balm set as she can watch as she applies it to her lips in the very cute having their favorite character on it. Thanks, TownleyGirl for sending me My Little Pony to try for free! All opinions are my own and I received the product for free in exchange for an honest and thoughtful review.